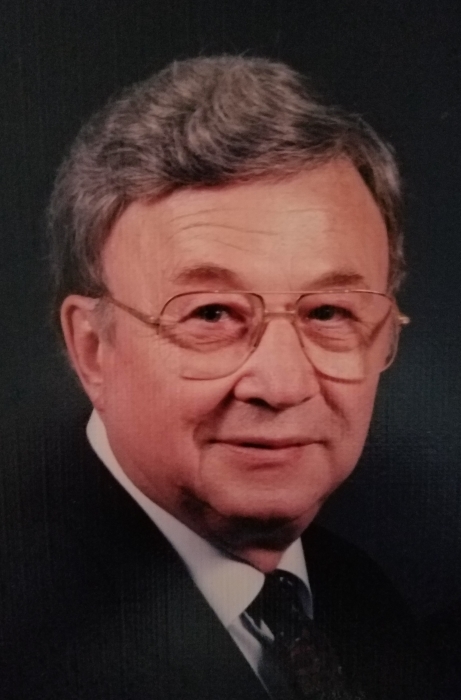 Mike Clyde Tachenko, age 95 of Dayton, formerly of Florida, passed away Wednesday, January 9, 2019 at the Suites at Walnut Creek. Mike started his grace journey on a horse and cattle ranch in North Dakota in 1923. He was the last child of 12, born to Russian immigrants, and named after his father who died when he was 16 years old. His father’s death was the first of many losses for Mike. He started his education in a one room school house where he learned English and the love of his country. His family housed a Seventh Day Adventist circuit riding preacher who converted the family to the faith. His church and faith in Jesus were always the stabilizing foundations in his life. Mike continued his education, graduating from Killdeer High School and attending Union College in Nebraska. While in college he joined the Navy in WWII. It was during this time that his sister Ann introduced him to the woman who became his first wife, Lola Beth Summerton. They settled near Beth’s family, around Endeavor, Wisconsin. Mike purchased and managed a dairy farm while Beth, a Registered Nurse, was the County Health Nurse. Mike and Beth had five children while they were living on the farm; Jeanette Lola, Michael Terry, Carrie Rose, Linda Lou and Teresa Lynn. Beth had a dream to open and operate a nursing home. Mike adored Beth, so he did double duty, managing the farm and continuing his education, becoming a Licensed Practical Nurse. They built and operated a nursing home until Beth’s tragic death in 1969. Because of Beth’s death, Mike realized he needed to change his focus back to Jesus and on the three children that were still at home. He felt the best way to do this was to give them a Christian education. Mike moved to Minnesota where there was a Christian grade school and academy for high school. In Minnesota, he worked at a lawn furniture company called Harris Pine Mills. In God’s plan of grace, Mike reconnected with old friends from Beth’s nursing school days. These friends became a great comfort to this lonely single father and they convinced him to move to Wisconsin with them, near another Christian academy. These friends introduced Mike to Anne Smith, who later became his second wife, and he went to work at Master Craft Industries in several positions, finally as personnel manager. Anne had made an incredible statement during their engagement. She said if she had ten good years married to Mike, she would be happy. Unfortunately, Anne became ill with Lou Gehrig’s disease. After a well fought fight, including experimental treatments in Germany, Anne passed. They were married ten years before she died. Mike was introduced to Marvella Harmon by the same friends that introduced him to Anne Smith. Mike and Marvella married in 1988 and were married 28 years, until her death in 2017. Marvella’s love for the Lord and her solid faith encouraged Mike’s sad heart and further strengthened his relationship with Jesus. From a young age, Mike witnessed through his own father the importance and value of serving God and others in your local church. As an adult, he served as an usher, deacon, elder, church representative, and Sabbath School teacher, freely using the gifts God had given him. Mike came to live in Ohio at Walnut Creek Assisted Living, near his daughter, Teresa and her husband, Gary in 2017. He had continuing dementia which robbed him of most of his speech but he remembered many people and experiences from his past, he could still say, “Thank you” and “I love you,” often with a big beautiful smile. Teresa told her dad frequently that God had a purpose for him even here in Ohio. On the day of his passing, when he could hardly talk, she said to him, “You know, dad, you had a purpose here at Walnut Creek… you were grateful and you showed Christ’s love.” He turned to her and said, “Yes”. Mike was preceded in death by his parents: Mike & Rose (Sokirka) Tkachenko, infant son: David Tachenko, 2 daughters: Carrie Westerback & Linda Tachenko Bain; brothers & sisters and their spouses: Matt (Olga), Gus (Stacy), Lonny, Joe (Alma) and Steve Tachenko, Leone Quast, Ann (Delmar) Holbrook; half brothers Nick Tkachenko, George, Andrew, and Sam Tachenko, Bill Sterling and John Davis; grandchildren: Alex Tachenko Bain, Timothy Westra; His wives: Lola Beth Summerton Tachenko, Ann Smith Tachenko, Marvella Harmon Tachenko. He is survived by 2 daughters: Teresa (Gary) Appleton - Kettering, Jeanette Westra - Cincinnati, son: Michael (Sharon) Tachenko – GA; step-son: Alan (Jackie) Harmon – FL, step-daughters: Janye (Bob) Miller – FL, Cindy Bohm – MN; sisters-in-law: Estelle Tachenko, Virginia Tachenko; sons-in-law: Dr. Michael (Melody) Bain – Cincinnati, Carey Paul Westerback – Wisconsin; grandchildren: Tiffany Nicole (Ethan) Underwood and their 4 children - GA, Michael Paul (Jennifer) Tachenko and their 3 children – NC, Ellyn Beth Bain Adams – Cincinnati, Bethany Rose Westerback – Wisconsin.